Turn on just about any news program and you’ll hear the term. Politicians love talking about what they are doing for “middle-class Americans.” The words make political points as they bring to mind hard-working salt-of-the-earth types with values, dreams for a future, the house behind a white picket fence, two dogs, one cat, (or vice versa) and a goldfish. Sure, that’s a lot to infer from a living condition category. But, it’s a cultural and financial touchstone. It’s also a goal for hundreds of thousands of American workers. 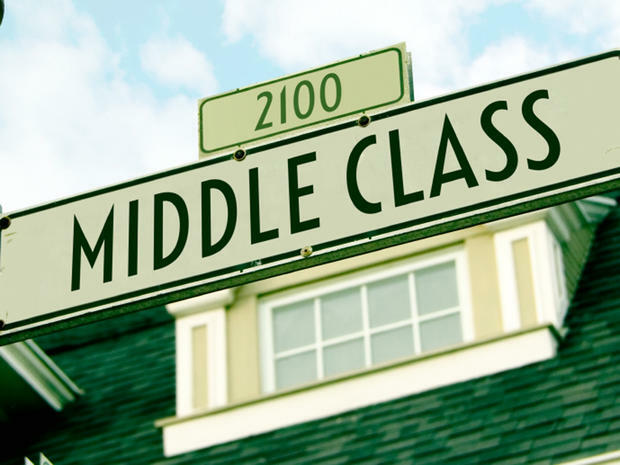 What is the “middle class”? Are you there? What needs to happen for you to achieve the middle? Are white and picket necessities, or would a lovely stained maple suffice? Let’s examine these, and other, questions. Bring along a calculator, because there will be math. We were taught in school that the middle is the dead center point. If so, it should follow that the middle class would be the average household income. To put it in a “class” let’s allow wiggle room of, say, 25% in either direction. Are we done here? Did anyone bring chips and dip? Except it isn’t anything like that easy. Several factors are in play before we can determine your own personal middle class. Call this a movable financial feast. How many people live in your house? A two-person family needs less than 50% of the money that a six-person crew needs to be “middle.” Those kids should buy you a nice house. They’re not cheap! *Time to Calculate* The average family spends $260,000 to get an only child from birth to 18 years of age. That means families with just one child must make $14,400 more per year than does a childless couple to be in the same lifestyle class. Fortunately, (for those of us with more than one child) additional kids cost less on a per child basis. This is due to multiple child discounts on child care, bulk food purchasing, and clothes that magically migrate from one child to another, among other factors. What’s your ZIP Code? The median income point, ergo the middle class, is a very different matter in different regions of the United States. Let’s apply the following factor: Give the average city’s cost of living index the number “100.” That means if the town in which you live, or the town you are considering, get a “110” it requires 10% more to live there than the average. Likewise, “90” means 10% less is needed, and so on. *Time to Calculate* Per Bert Sperling’s bestplaces.net, Coquille, Oregon, population 3,858, is as close to midpoint cost of living as we can find. He rates this small Coos County town at 99.9 in his cost of living calculation. According to the Washington Post middle-class calculator, a four-person household in Coquille will need at least $48,502 a year to be considered middle class. Contrast that with a city rated an “80” in Mr. Sperling’s equation. Among these would be El Reno, Oklahoma. There, $38,986 a year, for the same family of four, lands them squarely in the middle class. Are there more factors to being middle-class, and having a middle-class lifestyle than pure money? To some, there are indeed. At Gildshire we know folks who feel the need to own a home to be successfully middle-class. Others want to be able to take the family on a real vacation every summer. To still others, a brand new car every 2-3 years is the final answer. In short, your own middle class is yours, and only yours. Yes. Don’t ask why. It’s just one of life’s little mysteries.